King’s Balance in Hampi is an ancient and rare balance scale. It is located to the southwest of the Vittala Temple, at the end of the Kampa Bhupa’s Path. This rare balance scale is also known as Tula Bhara or Tula Purushadana. It attracts a lot of visitors due to its interesting history and its amazing structure that remains almost intact even today. The King’s Balance was used in the 15th century. It has a fascinating history associated to it. The story goes that the balance was used by the kings of the Vijayanagara Empire on special occasions like the New Year’s Day, Coronation ceremony, solar or lunar eclipse, Dasara, etc. The king used to weigh himself with gold, silver, gems, precious stones and jewellery and give away those things to the priests of the temples in charity. The interesting part is that as such an occasion approached, the royal kitchen used to prepare all the favourite dishes of the king at the insistence of the city council. The king would be provided fatty food at all times and would be allowed to move as less as possible. This was done so that the king would gain a few extra kilos and there would be a little extra wealth to distribute to the priests. The scale was also used to weigh grains and pulses in that era. The King’s Balance, Hampi, is a massive frame carved in stone. The monument consists of two beautifully carved granite pillars with a height of 15 feet. The pillars support a heavy stone beam of about 12 feet. There are three hoops on the underside of the stone beam. The hoops were used to hang the balance. One of the pillars has the image of the king and two queens carved on stone. The whole structure appears like an archway standing loftily. Though there is no trace of any balance today, the monument remains as an amazing example of the glorious days of the Vijayanagara Empire. The King’s Balance is one of the massive and rare scales found in India. It attracts a lot of visitors on the Hampi trail. Reaching the monument is an easy matter for anyone standing in Hampi. To reach Hampi by air one has to take a flight to the nearest airport located at Bellary. The distance between Hampi and Bellary is about 64 km. The airports at Belgaum (190 km) and Bangalore (353 km) are other options for visitors who wish to reach Hampi by air. From the airports other modes of transportation can be arranged to reach Hampi. For those visitors who want to reach Hampi by rail, the nearest station is located at Hospet. Hampi can be easily reached from Hospet as there are many buses that ply frequently between the two towns. There are also a few other local means of transport that cover the distance between Hospet to Hampi. Hampi is well connected by the road network. There are several buses that connect Hampi to the nearby towns and cities. 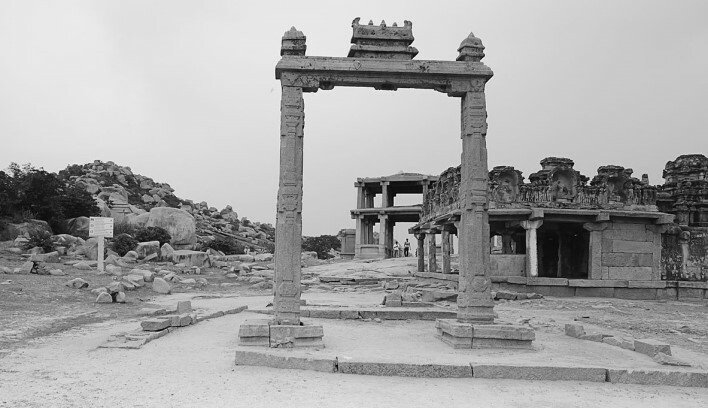 Visitors can hire private cars and vehicles from Bangalore or Mysore to reach Hampi.